On our vacation last April to my hometown, Morgantown, West Virginia, we made a stop at the remakable Fallingwater, Frank Lloyd Wright’s forest masterpiece in southwestern Pennsylvania. 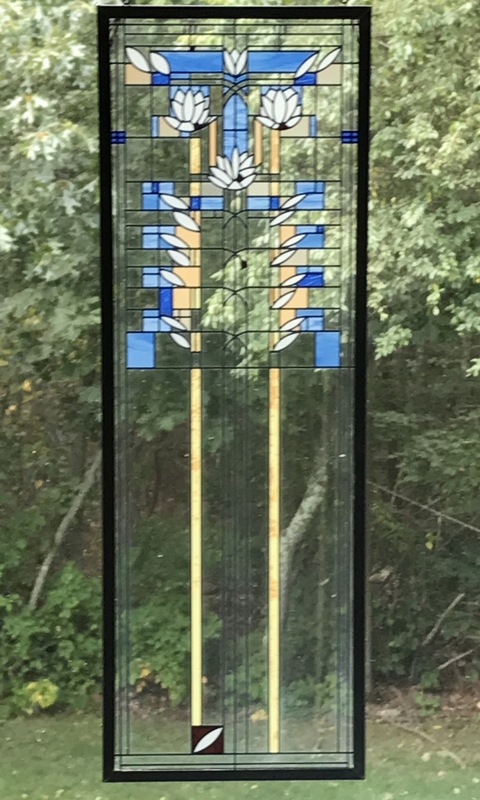 While there, my wife purchased a replica of a stained glass window Wright designed, which now hangs in the picture window of our master bathroom. Over time, the more I looked at this window, the more I am struck by the subtle effects Wright creates with the asymmetry he brings to the piece. At first glance, it appears to be a symmetrical piece, a vertical pane with the unmistakable Wright lines, simple verticals on the bottom half giving way to a tiled design with three lotus flowers above. The basic mass-produced design of a similar window might be completely symmetrical along its vertical center, and even a modestly talented designer might introduce an element of asymmetry such as the brown tile with the leaf motif on the bottom left. But as I have lived with this piece over the past months, I’ve come to appreciate the extent to which Wright incorporated asymmetrical design elements throughout the piece. The colored tiles on the piece are grossly symmetrical, but throughout, Wright has introduced asymmetrical elements, variations in color and size. And while the large brown tile bottom left grabs the eye, Wright has also included subtle flecks of brown midway up, in the flowers and at the top. And it is in the leaves and flowers that Wright introduces his most interesting asymmetry. First and most obviously, while the placement of the lotus flowers at the top is symmetrical, the flowers themselves each have a unique design, adding an organic element to what might otherwise be a more rigid piece. Beyond that, he breaks the leaf pattern on the left side, near the bottom of the sequence, by omitting a leaf. Even more remarkably, and something it took me days to notice, the entire leaf patten is left-handed, with the leaves on that noticeably larger. This makes no sense from a symmetry perspective, but is a fairly common organic pattern, though more so with animals. The whole effect, creating a patten then subtly, thoughtfully breaking it, brings life to the piece, and pleasure in seeing it again and again. This mirrors the process of creating dramatic tension in writing by establishing and subltly (or not, George R. R. Martin) frustrating it, bringing similar life to words. This entry was posted on September 15, 2017 by scarsonmsm in creative writing, cultural criticism. Commonplace books were a way in Early Modern Europe to compile knowledge. Such books were scrapbooks filled with medical recipes, quotes, letters, poems, tables of weights and measures, proverbs, prayers, legal formulas. Each book was unique to its creator's particular interests. The SuperDans are back at it again!